We’d love your help. Let us know what’s wrong with this preview of The Strangers in the House by Georges Simenon. Dirty, drunk, unloved, and unloving, Hector Loursat has been a bitter recluse for eighteen long years—ever since his wife abandoned him and their newborn child to run off with another man. Once a successful lawyer, Loursat now guzzles burgundy and buries himself in books, taking little notice of his teenage daughter or the odd things going on in his vast and ever-more-dila Dirty, drunk, unloved, and unloving, Hector Loursat has been a bitter recluse for eighteen long years—ever since his wife abandoned him and their newborn child to run off with another man. Once a successful lawyer, Loursat now guzzles burgundy and buries himself in books, taking little notice of his teenage daughter or the odd things going on in his vast and ever-more-dilapidated mansion. But one night the sound of a gunshot penetrates the padded walls of Loursat’s study, and he is forced to investigate. What he stumbles on is a murder. Soon Loursat discovers that his daughter and her friends have been leading a dangerous secret life. He finds himself strangely drawn to this group of young people, and when one of them is accused of the murder, he astonishes the world by taking up the young man’s defense. To ask other readers questions about The Strangers in the House, please sign up. 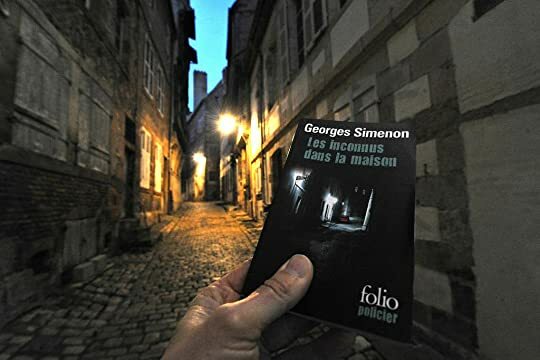 First published in 1940, a Georges Simenon non-Maigret roman durs or “hard novel,” a penetrating psychological study of Hector Loursat, a man who was a brilliant attorney in his younger days, awakened from his eighteen-year hermit-like existence by a murder committed in his own house. And why had Hector Loursat been living like a hermit all those years? For one very simple reason: without any explanation, Hector’s wife suddenly vanished, leaving him for another man, abandoned him and their two-year old daughter Nicole, left them both and the city of Moulins for good. Moulins. Located on the banks of the Allier River in central France, the atmosphere of this rainy French city with its cold air and wet streets, drab storefronts and even drabber courthouse, makes its presence felt on every page. "That evening Loursat stoked up his stove with special care, as the cold and the wet outside made the misty atmosphere indoors all the more luxurious. He could hear the patter of the rain and now and again the creaking hinge of a shutter that hadn't been properly closed and was caught by one of the sudden gusts of wind that swept along the street." And its on this cold, rainy autumn evening the story's drama begins: like a crack of a whip but with more weight, more percussion, a sound not from outside but definitely inside, a sound prompts Hector Loursat, after draining yet another glass of Burgundy and putting his cigarette back in his mouth, to rouse himself from his comfortable den chair and venture through hallways, stairways and rooms he hadn't set eyes on in years. Convinced the sound he heard was, in fact, the shot of a gun, Loursat makes his way to the other end of the house and knocks on Nicole’s bedroom door. Just then he catches the briefest glimpse of a disappearing figure, probably a man, stepping briskly down a set of stairs. Nicole, who is now a twenty-year old young lady, opens the door and asks her father what he wants. Without question, one of the most appealing and tender parts of the novel’s unfolding drama is how father and daughter come together to form a legal team in their efforts to solve the murder mystery. Detecting the scent of gunpowder, Loursat climbs stairs, Nicole trailing behind, and searches the third floor until he switches a light on in one of the rooms and discovers two eyes staring at him. A man, a large man, in bed, half covered in bedclothes gurgles, no wails, and then slumps over dead. Nicole gazes at her father, as if the most shocking thing in the room isn’t the dead man but her father standing before her, calm and weighty. For me, in addition to all the vintage Simenon laser-sharp character studies, a fascinating read on two counts: First, the novel’s structure – Part One, Hunting down the clues and reconstructing the facts in the aftermath of the murder; Part Two, the court case itself. In the hands of Georges Simenon, this tried and true lawyer fiction formula packs a punch. Second, how his eighteen years as a recluse puts Hector Loursant in touch with his own teenage years, a loner studying poetry and philosophy, thus giving him great insight and feeling for the emotions of the young adults that formed the city’s gang associated with Big Louie, the murder victim. Turns out, Loursant's insights and feelings serve him well in his reentry into the world of action and his role as lawyer. A probing existential novel that will keep you turning the pages. Questo è il mio Simenon preferito. Il Simenon che ho sempre voglia di rileggere, e prima o poi lo farò. La prima versione cinematografica è del 1942, si intitola come il romanzo, “Les inconnus dans la maison”, la regia è di Henri Decoin, la sceneggiatura di Henri-Georges Cluzot, e il protagonista è interpretato da Raimu. Ambientato nella provincia francese, quella che Simenon sa rendere in maniera magistrale. In questo caso siamo a Moulins, nell’esatto centro della Francia: è un comune di soli ventimila abitanti, ma nella posizione geografica perfetta per essere la capitale della nazione. Sempre la versione del 1942 che in Italia prende l’insulso titolo di “Gioventù traviata”, in anticipo di tredici anni sul mitico film che lanciò James Dean, “Rebel Without A Cause – Gioventù bruciata”. Inizio di ottobre, i primi freddi veri, comincia l’autunno, piove, è sera. Il protagonista non ha ancora cinquant’anni, è un avvocato di famiglia prestigiosa, Loursat de Saint-Marc: vive come un orso, barricato nella sua stanza studio piena di libri, accanto alle sue preziose e ottime bottiglie di borgogna, di cui fa uso quotidiano in numero di almeno tre. Non esercita più la professione, si è ritirato, chiuso in se stesso, senza quasi pronunciare parola per giorni interi, trasandato e sciatto. Nel 1967 esce “Stranger in the House – Uno sconosciuto in casa” di Pierre Rouve, versione inglese. La ragione della sua discesa esistenziale è che sua moglie lo ha lasciato diciotto anni prima: dopo aver vissuto insieme per tre anni, è scappata col suo amante, che si mormora avesse già da prima del matrimonio - ha abbandonato anche la figlia, Nicole, per quanto ancora molto piccola. Padre e figlia si incontrano solo a cena: consumano, senza aprire bocca se non per masticare, pasti preparati dalla cuoca, nel silenzio più completo, interrotto solo alla fine da mezze parole mormorate, quando il padre si alza da tavola per ritirarsi nella sua stanza, dove continuerà a bere tutta la notte. 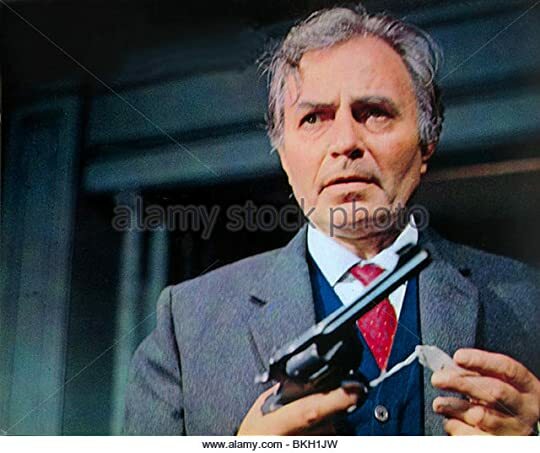 Il protagonista del film inglese è James Mason. Sua figlia è interpretata da Geraldine Chaplin. Ma questa fredda e piovosa sera di inizio ottobre è diversa. O meglio, succede qualcosa di diverso, di assolutamente insolito. Nel silenzio notturno dell’antico palazzo echeggia uno sparo. Loursat esce dalla sua stanza per capire cosa è successo, vede un’ombra che si dilegua in fondo a un corridoio, e in una stanza del secondo piano trova un uomo che muore sotto i suoi occhi. Chi è, che ci fa in casa sua, chi gli ha sparato, chi lo ha ucciso? Non so in che paese fu adottata questa locandina (Ungheria? ): certo colpisce per la perfetta temporalità della grafica che sembra presa pari pari dalla copertina di un album dei Beatles. 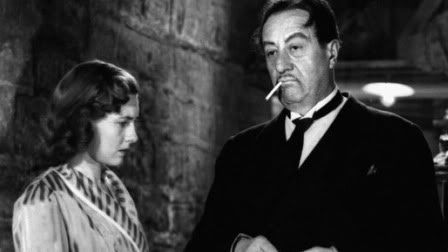 Qui Simenon tira fuori tutto il suo talento di indagatore dell’animo umano ed esibisce grande delicatezza nel descrivere il nuovo rapporto che si instaura tra padre e figlia, fatto di tenerezza appena accennata, sguardi e piccoli gesti d’affetto. Come se entrambi fossero timorosi di rompere il nuovo imprevisto incanto che si è creato tra loro, l’inizio di un sentimento d’amore che si era interrotto diciotto anni prima. L’uomo scopre man mano la figlia e il suo mondo, e viceversa, la giovane comprende il vuoto del padre e impara il suo valore sepolto. Entrambi imparano a volersi bene. 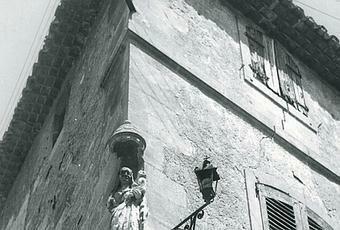 Il palazzo Loursat de Saint-Marc a Moulins. È un piacere vedere come l’uomo recupera il suo mestiere, la sua abilità di avvocato nella difesa del giovane innamorato di sua figlia che è accusato dell’omicidio. È una goduria vedere come spezza la cappa di perbenismo del paese, incurante d’andar contro la sua classe sociale. Simenon è scarno, asciutto, perfino lapidario, quasi pudico. Ma i suoi ritratti psicologici e fisici, per quanto accennati, sono completi. Scritto nel 1939, Gli intrusi apparve a stampa l’anno successivo. I personaggi di Simenon escono fuori dalla carta. E siccome non sono mai stinchi di santo, condividi con loro per tutta la lettura i vizi, le miserie, gli errori... ma anche l'umanità. E alla fine li assolvi, in barba a tutta la giustizia terrena. O sei costretto a guardarli con compassione. Una penna magica quella di Simenon. Imbeciles! A whole town of fools, of wretched human beings who didn't know why they were alive, who were moved along like cattle, complete with yoke and bell! Obviously had I read this novel straight through, it wouldn't have taken 15 days to do so -- I was sidetracked by Rasputin. Most crime readers are very much into plot but in Simenon's romans durs, it's more the psychological/existentialist aspects of the characters that take center stage, and unless I'm at a point where I need fluff, that, of course, is the draw for me as a reader no matter which genre I read. The Strangers in the House highlights this distinction -- the story opens with a crime, there is an arrest, a trial and an aftermath, but this tale centers on lawyer Hector Loursat, 48, who for about 18 years after his wife had left him, has been living as a rather lethargic recluse in a small French town with his daughter Nicole. Loursat has decided to live as a "hermit," and he and his daughter have been virtual strangers her entire life, with Nicole's upbringing having been put into the hands of one of the "domestics." Lousart has during this time followed a regular routine -- several bottles of burgundy, followed by time spent reading in his study or his bedroom, and quiet dinners with his daughter where neither made any attempt at conversation. Lousart's life is about to change, though, with the discovery of a dead stranger in his house, which also leads to his own realization about himself: that "he'd never tried to live -- not in the ordinary sense of the word." "the salient facts which bring alive a character or a place, inducing the reader to contribute his own imagination to that of the writer so that more is conveyed than is written." While I enjoyed his The Engagement much more, I can most certainly recommend The Strangers in the House to people who, like me, are more into reading to discover what he/she can about human nature. This one definitely speaks volumes. C’è un lieve ma significativo scarto fra il titolo originale di questo romanzo e la versione italiana. 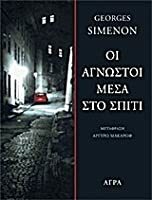 Può sembrare una pignoleria ma il romanzo di Simenon, benché non annoverabile fra i suoi migliori soprattutto a causa del mediocre e invadente risvolto poliziesco, vive di sfumature e allusioni, come avviene sempre o quasi nelle sue opere prive della figura del Commissario Maigret, i cosiddetti “romans durs”. Ci sono le sfumature create dal talento dell’autore nel rivelarci con pochissime ma precise pennellate la vita malinconica e grigia di una cittadina avvolta da un’atmosfera costantemente autunnale, (il suono sull’asfalto bagnato degli pneumatici delle rare automobili percepite oltre la finestra, il cinemino semideserto con la bigliettaia intirizzita, un ombrello che svolta il marciapiede d’angolo visto dall’orlo di una tenda, le bettole di periferia dalla luce opaca e ambigua) suggestioni che ricorrono e talora distraggono l’attenzione dell’avvocato Loursat, spesso avvolto da una nube di fumo e di Bourgogne. E nello stesso Loursat abbiamo un ulteriore esempio della galleria di tormentati protagonisti nati dalla penna di Simenon, un uomo che da quasi vent’anni vive in un’ampia e cadente dimora quasi da recluso dopo l’improvviso abbandono della moglie e che un evento imprevisto proietterà inaspettatamente verso la vita: “…così si mette a perlustrare la città. Scopre persone, odori, suoni, negozi, luci, sentimenti”. Not my favorite Simenon book, but still it's interesting and quite good. Reading the plot line is actually better than the book for some reason. And again it could have been a mood thing at the time of the reading of this book. Nevertheless Georges Simenon's work is pretty amazing. He has this cold or cool overlook of everything. He really doesn't judge his characters, which is great. I just re-read the book and my overall thoughts are the same, but what impresses me about Simen Not my favorite Simenon book, but still it's interesting and quite good. Reading the plot line is actually better than the book for some reason. And again it could have been a mood thing at the time of the reading of this book. Nevertheless Georges Simenon's work is pretty amazing. He has this cold or cool overlook of everything. He really doesn't judge his characters, which is great. In fact he pretty much ignores the world around him - including things that go bump into his household. A murder takes place upstairs from his room, and he wasn't even aware that people were holding meetings, and leaving off stolen loot on his property. And even worse, his daughter was involved in the gang as well. Good but not as engrossing as the other romans durs of Simenon I've read. A father (Loursat) sequesters himself in his large home after his wife leaves, barely communicating with his servants and daughter (who's two at the time). He drinks and broods and seeks no one's company for years. A murder in his house changes the balance of things in the household and Loursat, a lawyer, even decides to take on the defense of his daughter's unjustly accused young lover. There is much here about the petite Good but not as engrossing as the other romans durs of Simenon I've read. A father (Loursat) sequesters himself in his large home after his wife leaves, barely communicating with his servants and daughter (who's two at the time). He drinks and broods and seeks no one's company for years. A murder in his house changes the balance of things in the household and Loursat, a lawyer, even decides to take on the defense of his daughter's unjustly accused young lover. There is much here about the petite and haute bourgeousie, small town life, the deadening of doing what's expected. And there's the beauty of Loursat springing back to life: "He had the impression of plunging back into life. He did things he had long since forgotten--or that he still did, only without realizing he was doing them--like turning up his overcoat collar, thrusting his hands deep in the pockets, and savoring the cold and the rain, the strange reflections of the sparkling streets." THE STRANGERS IN THE HOUSE. (1940). George Simenon. ****. This is certainly among the best of Simenon’s “psychological novels.” The story here takes a close look at a lawyer who has withdrawn from society, to the point where he doesn’t even know what is going on in his own house. His life thus far has not been personally successful. His wife left him for another man nearly eighteen years ago – leaving him to take care of their two-year old daughter, Nicole. He and Nicole rarely talked, and their THE STRANGERS IN THE HOUSE. (1940). George Simenon. ****. This is certainly among the best of Simenon’s “psychological novels.” The story here takes a close look at a lawyer who has withdrawn from society, to the point where he doesn’t even know what is going on in his own house. His life thus far has not been personally successful. His wife left him for another man nearly eighteen years ago – leaving him to take care of their two-year old daughter, Nicole. He and Nicole rarely talked, and their closest contact came at mealtimes, when they sat down together. After dinner he returned to his soundproof study and continued to read while finishing up his third bottle of wine for the day. One night, however, he hears what sounds like a gunshot. When he goes to the other wing of the house and climbs to an upper story, he finds a man in one of the bedrooms; he had been shot and killed. He later learns that his daughter, along with several other young people from the village, had formed a club which met once a week in his house – again, without his knowing it. There they planned larks and mischief that outraged the villagers, but were beyond his ken. He is forced out of a semi-retirement, at this point, to represent one of the youths accused of the murder at a murder trial. He comes alive while working at his craft and begins to understand the fact that he has to somehow get back into the swing of life. Although this is a mystery at its root, it is more of an exploration of the mind of the lawyer, and how he had isolated himself from life. Recommended. There is in all the novels of Simenon a high weight on his characters. They are not free. They are the toys of their destiny. They evolve to their inevitable tragedy because they are resigned to being the slave of their passion. There is Greek tragedy in these novels. One summer I decide to read all Simenon's book in Pléiade collection. There is something which trouble me in this incapacity to be able to act on his fate. I think we have always the choice. However Simenon is an immense writer and not There is in all the novels of Simenon a high weight on his characters. They are not free. They are the toys of their destiny. They evolve to their inevitable tragedy because they are resigned to being the slave of their passion. There is Greek tragedy in these novels. Eighteen years ago lawyer Hector Loursat's wife ran off with another man, and ever since then Loursat has lived in a state of alienation from the world, ignoring even his daughter Nicole as he devotes his days to reading books and downing prodigious quantities of red wine. But one night there's a murder in his house, a murder that clearly has much to do with Nicole and the bunch of childishly criminal friends she has, without Loursat's knowledge, gathered around her. When the cops arrest Emile, Eighteen years ago lawyer Hector Loursat's wife ran off with another man, and ever since then Loursat has lived in a state of alienation from the world, ignoring even his daughter Nicole as he devotes his days to reading books and downing prodigious quantities of red wine. But one night there's a murder in his house, a murder that clearly has much to do with Nicole and the bunch of childishly criminal friends she has, without Loursat's knowledge, gathered around her. When the cops arrest Emile, Nicole's lover (another surprise for Loursat! ), the old man is finally moved to become a father once more to his daughter, rejoin the world and mount Emile's legal defense. 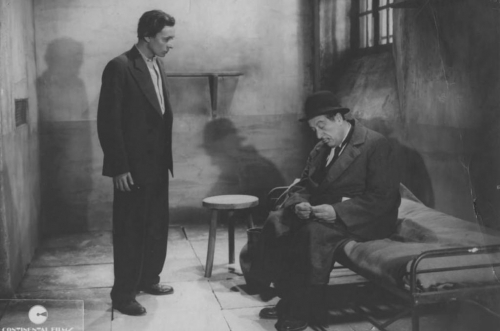 I was fairly familiar with the story, having seen two of the (at least) four movies based on it: Les Inconnus dans la Maison (1942) and the much inferior Stranger in the House (1967). At some stage I'd very much like to see the Georges Lautner remake, Les Inconnus dans la Maison (1992), with Jean-Paul Belmondo. I found this novel completely absorbing and yet at the same time I was aware of its flaws. It might be unfair to say that, had it been written originally in English by Joe Schmoe and offered around to publishers today, it could have had a little difficulty in finding a taker. This is not just because the translation is a bit stiff (it dates from 1951, although apparently with later revisions) but because there's an air of unreality about the proceedings and the characters. I actually found that this air of unreality was part of what kept me rapt, but it does detract from The Strangers in the House as a mystery novel. And that's not the only reason to quibble. Loursat solves the crime not through any real act of deduction on his part but because an out-of-left-field witness sends him a note telling him the killer confessed to her in a moment of weakness. Moreover, we're never given any motivation the murderer might have had for the killing -- Loursat just shrugs the matter off as something that'll undoubtedly emerge at some point in the future but that's not worth bothering with now. In other words, there's no opening at all for the reader to try to deduce the identity of the villain. Of course, one could say that in this respect the tale is more like real life, but then this clashes with the sense of unreality I mentioned above . . .
Of course, there's absolutely no reason why a novel should be compelled to fit into a genre straitjacket! Yet The Strangers in the House does presents itself as a crime/mystery novel -- or a psychological study along those lines -- so it's reasonable to respond to it accordingly. 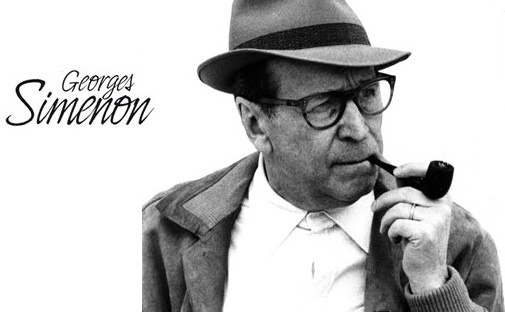 Until this spring, I'd never read anything by Georges Simenon, the indecently prolific (400 books?!) author of the popular Maigret detective stories, as well as shelves of romans dur – hard Hobbesian parables (solitary, poor, nasty, brutish, and short) of mid-20th century misery. I still haven't read Maigret, but I've become addicted to the romans dur, mostly because New York Review of Books has been republishing them in stylish, haute-noir paperbacks. I started with Three Bedrooms in Manhattan, Until this spring, I'd never read anything by Georges Simenon, the indecently prolific (400 books?!) author of the popular Maigret detective stories, as well as shelves of romans dur – hard Hobbesian parables (solitary, poor, nasty, brutish, and short) of mid-20th century misery. I still haven't read Maigret, but I've become addicted to the romans dur, mostly because New York Review of Books has been republishing them in stylish, haute-noir paperbacks. I started with Three Bedrooms in Manhattan, then sped through The Engagement (source for Leconte's great late 80s movie Monsieur Hire), The Man Who Watched Trains Go By, Dirty Snow, Tropic Moon, and most recently, Red Lights. I savored each of them but I think this book, The Strangers in the House, is my favorite. Simenon seems to block out his plots like a sculptor hewing out chunks of rock. Most of his characters have a chiseled stony quality that precludes sympathy or sentimentality. Almost. Hector Loursat, the stranger at the heart of this book ("dirty, drunk, unloved and unloving" according to the blurb), redeems himself – something most Simenon characters would find inconceivable. Even more than the others, this roman is deliciously bitter – as in ultra-dark chocolate, not sour grapes. A reclusive lawyer is forced back into the hurly burly of existence when a murder takes place in his house. Simenon is really, really good, and this is fabulous, at once a genuinely compelling noir and a serious take on the common impulse to retreat in contempt before the banal idiocy of human contact. Loved it, strong rec. Loursat è oramai alla metà dei suoi anni. La sua vita si svolge essenzialmente all'interno del suo studio e della sua biblioteca. Si accompagna intere notti con fumo e alcol, leggendo tratti di romanzi e saggi senza davvero impegno. Fino a che non ode un rumore estraneo: è un colpo di pistola. Così si ritrova coinvolto nella morte di un uomo mai visto, di un gruppo di giovani scalmanati e nella vita, per lui segreta, della figlia Nicole. Senza parlare troppo del contenuto e della trama del romanzo, ovviamente parlando dal punto di vista del "mistery" e del "noir", Gli Intrusi è un romanzo simile a un romanzo di formazione. Simile perchè effettivamente avviene una sorta di crescita, di cambiamento, ma il protagonista di questo cambiamento non è un giovane ragazzo: si tratta del vecchio Loursat. Prima di tutto, è stato un libro piacevolissimo che mi ha subito accattivato la simpatia di Loursat, sia prima che dopo il suo risveglio. Nonostate sia un vecchio alcolizzato, la sua visione delle cose delle volte è più lucida di tutti gli abitanti della cittadina. Di solito, verso le tre, faceva una passeggiatina attorno all'isolato, un po' come portare fuori il cane, e come se tenesse al guinzaglio se stesso. Questa volta, appena uscito, infranse la regola: si fermò,si girò, e rimase un momento lì, sul bordo del marciapiede, a contemplare la casa. Impossibile capire cosa provasse, e se quella vista lo rallegrasse, oppure no. Era... straordinario, ecco! Vedeva la sua casa! La rivedeva come quando era bambino o giovanotto, la ritrovava come quando ci tornava in vacanza a Parigim, all'epoca in cui studiava legge. Camminando per le strada, rendendosi conto della realtà che lo contorna, indigando su ogni tassello che potrebbe comportare la condanna o la salvezza di Emile Manu, Loursat si risveglia e si meraviglia del banale, risconprendo la vita anche nella sua forma più piccola. Gli eventi recenti e le storie che si svolgono, tornanto a sfiorare il passato, chiedendosi cosa abbia portato Loursat a divenire cosa è nel corso delle pagine. Altrettanto interessante è come il vecchio non volga lo sguardo all'indietro ripensando alla casa e alla moglie che lo ha abbandonato, ma anche osservando la compagnia poco raccomandabile a cui Nicole e Manu si sono uniti, prima una e poi l'altro. L'attenzione gli ricade sui loro gesti avventati, sulle loro piccole follie, sulle loro serate di alcol, balli e scommesse, le loro avventure apparentemente senza freni. Loursat si guardo indietro e anche allo specchio, domandadosi cosa sia accaduto durante la sua vita. Ma non aveva amici, lui. Viveva da solo, esaltandosio per certe idee, per certi filosofi, per certi poeti. Che tutto il male derivasse da lì? [...] Gli sembrava che fra i tempi di Geneviève e il presento ci fosse non tanto un vuoto quanto un immondo pantano, una palude in cui tuttora annaspava. Gli Intrusi non è solo la storia di crimine quanto una curata e guizzante visione di uomo-orso, che poi non è così distante neppure degli uomini di adesso, che si chiudono in una stanza a lasciarsi sfuggire il tempo fra le dita. Simenon has a knack for noir, at least for this reader. I appreciate his emotionally cerebral approach and find all his stories appealing. Loursat is a difficult character to warm up to. I found myself wanting to slap and embrace him. Just when you sense Loursat has finally emerged from his stupor he slips back into old habits while acknowledging his error, he’s apathetic and pathetic. He’s not just an absent parent, he’s absent from life. You have hope as he somewhat cleans up his act but you so Simenon has a knack for noir, at least for this reader. I appreciate his emotionally cerebral approach and find all his stories appealing. Loursat is a difficult character to warm up to. I found myself wanting to slap and embrace him. Just when you sense Loursat has finally emerged from his stupor he slips back into old habits while acknowledging his error, he’s apathetic and pathetic. He’s not just an absent parent, he’s absent from life. You have hope as he somewhat cleans up his act but you soon realize it’s only temporary although far from the recesses where he first started his decline. As all of Simenon’s characters, Loursat is heavily flawed, with few redeeming qualities. Forced into a self discovery journey his missteps continue without remorse or regret. Redemption unattainable as his relationship with his daughter is negatively cemented, the damage irrevocable. The courtroom scene was rather sterile. Simenon’s writing pulls the reader through once again creating the edge solely relying on Loursat. His affecting characterization in tandem with solid writing conveys the atmosphere perfectly. I loved the first Simenon I read (Dirty Snow) and hoped this would be as good. It wasn't --quite. Simenon again creates a character on the edge of society, this time it is Loursat a disgraced, former lawyer who has fallen from an elite to a drunken recluse. Loursat's world is described so well, so fully that it almost make sense, it is almost appealing. But the other characters are not as filly realized and as Loursat's journey back to society progresses there is less and less to hold on to. And I loved the first Simenon I read (Dirty Snow) and hoped this would be as good. It wasn't --quite. Simenon again creates a character on the edge of society, this time it is Loursat a disgraced, former lawyer who has fallen from an elite to a drunken recluse. Loursat's world is described so well, so fully that it almost make sense, it is almost appealing. But the other characters are not as filly realized and as Loursat's journey back to society progresses there is less and less to hold on to. And like Dirty Snow, the book just seems to end as if the other ran out of gas or got bored with it. The best part is that same strange semi-omniscient narrator from Dirty Snow. The narrative voice, at once precise and unsure, keeps you guessing. Consider this passage from (24): "His step was already heavy, and his gait, if not exactly stumbling, was uncertain. After all, since the morning , he'd drunk two or three bottles of burgundy, more likely three than two, which he brought up from the cellar first thing, and handled with great care." The plot has a similar sense of whimsy in that it explores how quickly everything can change, and change again. "E Loursat, sempre da solo, ancora dignitoso, se ne stava seduto al tavolo di un bistrot, davanti a un bicchiere di vino rosso." Mi è difficile esprimere la gioia, mista a tristezza, quando si termina un libro come questo. Un libro che ho divorato voracemente, appassionandomi alla figura dell'avvocato Loursat e alla sua vita sedentaria, introversa, tra un bicchiere di vino e la lettura di qualche libro. Da sfondo (e nemmeno tanto) a tutto ciò, avremo una banda di giovani, di diversa estrazione soc "E Loursat, sempre da solo, ancora dignitoso, se ne stava seduto al tavolo di un bistrot, davanti a un bicchiere di vino rosso." Un libro che ho divorato voracemente, appassionandomi alla figura dell'avvocato Loursat e alla sua vita sedentaria, introversa, tra un bicchiere di vino e la lettura di qualche libro. Da sfondo (e nemmeno tanto) a tutto ciò, avremo una banda di giovani, di diversa estrazione sociale, e un omicidio. Ma, davvero, non voglio anticiparvi niente: leggetelo, ne vale la pena. Succede che a saper leggere la vita sia proprio chi, quella stessa vita, non ha mai neppure tentato, forse, di viverla. Ombre, più che uomini, che nel buio di stanze piene di libri e sigarette, di vino e di torpore, coltivano la capacità di scorgere il vero, le intime leve di ogni gesto. E che sia uno sguardo o un omicidio, non ha poi così importanza. Nice. One of the better ones. Loursat is a very rich character, indeed. The Wilt Chamberlain of French letters. "I've just found a stranger in my house ... in bed, in one of the rooms on the third floor ... He died at the exact moment I reached him ... Will you see about it, Gérard ? ... It's really tiresome. It looks to me like a criminal affair." "Drunk as usual" is what the prosecutor's wife (who happens to be Loursat's cousin), listening in on the conversation, thinks, but Loursat isn't the sort to make prank calls or imagine things: it's all exactly as he said. And it is a bother, too: Loursat is part of the community, but he's also kept very much apart from it, for eighteen years now, ever since his wife up and left him -- and their then two-year-old daughter, Nicole. Pretty much all he had concerned himself with all that time since was numbing himself with a constant and steady flow of alcohol. As he soon learns, he's become oblivious to even what's going on under his own roof, and it takes a murder to shake him out of it. He hadn't been much of a father to Nicole -- "He simply washed his hands of Nicole" -- but then he wasn't even sure he was her real father. She still lived in the house, however, -- and, as it turned out, she was involved with a lot going on in the house Loursat was unaware of, things that, as one of the maids tells him: no reasonable person would have believed, that is, not if this hadn't happened. The man who was shot turns out to have been a thug who Nicole and her friends had accidentally hit with their car. They had brought him here, and eventually someone had killed him. The prime suspect is Nicole's lover, Emile, and it is Emile who is charged with the crime and brought to trial -- and it is Loursat who takes on his defense, aided by Nicole. The Strangers in the House isn't a heart-warming tale of redemption, the drunkard sobering up to embrace what's left of his family again (and save the hide of the poor innocent while he's at it) -- though that is, more or less, what happens. But Simenon doesn't ever lose the very hard edge to his story-telling. These are all people with faults, and there's much here that can't be bridged. 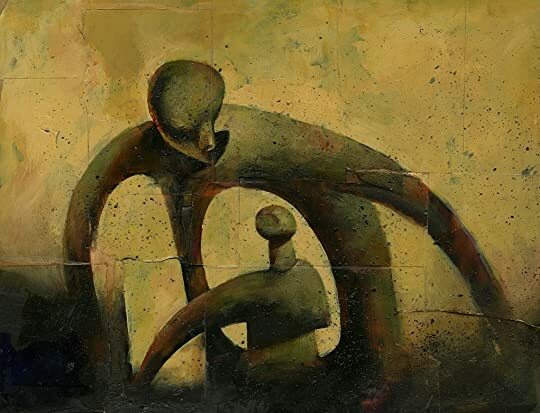 Father and daughter remain at a wary distance, for example, and even if there is a new-found connexion between them at the end the remaining distance is also made explicit. The focus of the story is on Loursat, who does what needs be done. It's less a journey of self-discovery -- though he does wonder a bit how he's come to lead such a life, and does find himself: "plunging back into life" -- than of simple discovery: figuring out, as lawyer and detective, what happened. In part Loursat can act sensibly and assess the situation dispassionately because of the very distance he has placed himself at. The goings-on in his house and in the neighbourhood involve many of the more important families in the area; Loursat's unpleasant nephew is also mixed up in it. Loursat doesn't pass judgment, not even when he figures out (pretty quickly) that Nicole and Emile are lovers, while for almost everyone else there are reputations and the like to consider. Quick, at times almost sketchy, Simenon's writing nevertheless convincingly captures an atmosphere and mood, and Loursat is very well drawn (as is the almost shadowy Nicole). Loursat's alcoholism (and then sobriety) aren't entirely credible -- after almost two decades at this pace he should surely be completely pickled -- but otherwise he's a very impressive figure. 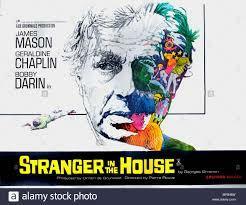 The Strangers in the House follows Loursat, a formerly respected lawyer from a prominent family who has retreated to his bedroom, his books, and his wine since the sudden departure of his ex-wife decades earlier. The man is now pitied or despised or unloved by virtually everyone, including by his daughter who lives in his decrepit old house but with whom he rarely speaks. One evening, Loursat’s decades long stupor is suddenly shaken when he hears a gunshot, finds a murdered man in his home, and The Strangers in the House follows Loursat, a formerly respected lawyer from a prominent family who has retreated to his bedroom, his books, and his wine since the sudden departure of his ex-wife decades earlier. The man is now pitied or despised or unloved by virtually everyone, including by his daughter who lives in his decrepit old house but with whom he rarely speaks. One evening, Loursat’s decades long stupor is suddenly shaken when he hears a gunshot, finds a murdered man in his home, and discovers that his daughter has managed, to his amazement, to build a life for herself. Slowly, the events of that night begin to draw Loursat himself back toward life. 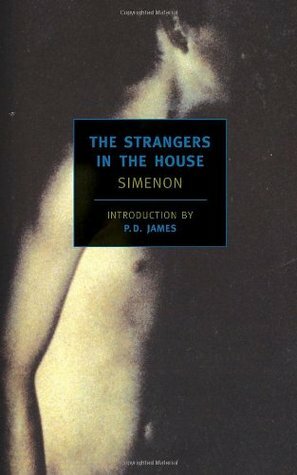 The Strangers in the House is the first novel I’ve read by Georges Simenon, and I wouldn’t be surprised if, when I reach next January, it’s still the best novel that I’ve read for the year. Simenon’s style is direct and subtle. With the slightest of images, Simenon can open up a character’s inner world. I appreciated this plot, too. It’s a mystery, in a way, but it’s not any sort of procedural with the detective unturning and piecing together clues. Instead, it’s a psychological sort of mystery, with Loursat studying himself and the characters of those around him, to reach an understanding. This is one of Simenon's "romans durs," or "hard novels," an intimate exploration of a lawyer named Loursat who has essentially barricaded himself in his house for eighteen years after being abandoned by his wife. He drinks and reads books and cuts himself off from those around him, including his daughter, who was two when Loursat's wife left him. Loursat comes alive when he discovered that a murder has taken place in his house, and he uncovers a hidden life outside his padded study. He decides This is one of Simenon's "romans durs," or "hard novels," an intimate exploration of a lawyer named Loursat who has essentially barricaded himself in his house for eighteen years after being abandoned by his wife. He drinks and reads books and cuts himself off from those around him, including his daughter, who was two when Loursat's wife left him. Loursat comes alive when he discovered that a murder has taken place in his house, and he uncovers a hidden life outside his padded study. He decides to take on the defense of his daughter's young lover, who has been unjustly accused of the murder. This is a good but not enthralling example of Simenon's work outside his Inspector Maigret books. It's essentially a story of Loursat's awakening as a sentient being, and also a whodunit with a not very surprising denouement. However, as usual, Simenon's detailed psychological analysis of the characters is very compelling, and Loursat transforms himself from being pathetic and an object to be pitied. He achieves an almost heroic status in his final interrogation in the courtroom trial, and that section is quite riveting. But we learn that the real stranger in the house has not been the members of the gang who have, unbeknownst to Loursat, occupied the third floor of his abode, but rather Loursat himself, who has exiled himself from life for almost two decades. This review has been hidden because it contains spoilers. To view it, click here. "The Strangers in the House" starts out great. Loursat, a middle-aged, bear-like former lawyer and current drunk, lives in a large, crumbling mansion. One night, after retiring to his study from a quiet dinner with his adult daughter, he hears a gun shot; and, exploring a neglected wing of his home, discovers a dead man. 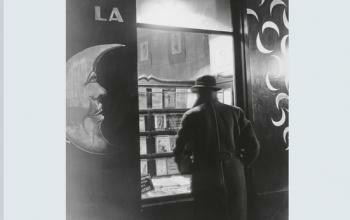 Loursat notifies the police, and an investigation is begun. It's a fun and spooky start, with a promising mystery and interesting characters. The rest of the book, however, is a "The Strangers in the House" starts out great. Loursat, a middle-aged, bear-like former lawyer and current drunk, lives in a large, crumbling mansion. One night, after retiring to his study from a quiet dinner with his adult daughter, he hears a gun shot; and, exploring a neglected wing of his home, discovers a dead man. Loursat notifies the police, and an investigation is begun. It's a fun and spooky start, with a promising mystery and interesting characters. He is best known, however, for his 75 Simenon was one of the most prolific writers of the twentieth century, capable of writing 60 to 80 pages per day. 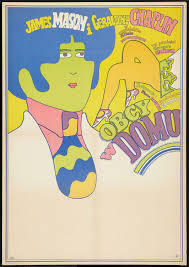 His oeuvre includes nearly 200 novels, over 150 novellas, several autobiographical works, numerous articles, and scores of pulp novels written under more than two dozen pseudonyms. Altogether, about 550 million copies of his works have been printed.